West Brom manager Tony Pulis says he "hopes and prays" striker Saido Berahino can cope with the inevitable speculation over his future when the transfer window re-opens in January. Tottenham had the last of four bids for the 22-year-old rejected in September, leading to Berahino saying at the time he would not play for Albion again. "If he goes, he goes - that won't be my decision," Pulis told BBC WM 95.6. "Here we go again - you hope and pray he can deal with it all again." Berahino, who is set for his first start since the end of October in Boxing Day's trip to Swansea, played his first game in nearly a month in the Baggies' 2-1 home defeat by Bournemouth last Saturday as a last-minute substitute. Pulis said he was happy to have the England Under-21 international back in contention but questioned whether he was in the right shape to think about leaving The Hawthorns. "He's nowhere near what he was last year physically or mentally," he said. "If he stays, you hope you get a Saido that realises the club and the supporters - who've been wonderful to him - need him. "This is a very famous club and it's had some wonderful players - I hope he shows that and gives it back in abundance." 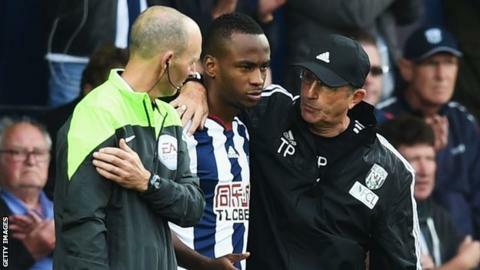 Berahino has had a difficult relationship, at times, with West Brom and the fans and Pulis admitted it is a challenging situation for him to try and manage. The Baggies boss said people who are around the player and advising him had not helped. "He's got too many people blowing in his ear and telling him what he should be doing. It's not just agents, it's everybody - they've played with his mind," Pulis said. "He's been blessed with a great talent. It's been difficult for everybody at the football club - you want to help him and see through the mist and the clouds that have gathered around him. "I've spent a lot of time with Saido by himself. The problem is Saido will listen to you and be as good as gold then someone speaks to him and puts something in his mind and then, all of a sudden, he's off and running down a different lane again and you have to drag him back in."